Morning reminds us that darkness never lasts forever. I don’t really have a bucket list; I’ve never seen the point in one. I refer to things as if they were on my bucket list but in all actuality, I don’t have a hard copy. Why? Well, it’s simple really. I’ve known people who kicked the bucket with a lot of stuff left on their list; places they wanted to visit, things they wanted to do, life they never had a chance to live. Instead of wondering at the beauty which lay around them, they spent their time dreaming of the day they could leave and experience life. And that day never came. I also know people who have a conservative bucket list: “These are the five things I HAVE to do and see before I die.” But we aren’t guaranteed tomorrow, we’re only given today. It’s ok to have dreams and work towards making them a reality, but we must learn to truly live in the present and embrace each day as if it were an item on our bucket lists. I’ve learned to check things off my list daily and this past weekend was definitely no exception. I ended up flying out to California to help my brother propose to his girlfriend. He had set up a treasure hunt for her across the Napa Valley and I was given the exciting task of staying ahead of her while buying everything at the different places she would stop. After that crazy whirlwind of a day (a whole different story in itself), I went to sleep just past midnight with my alarm set for 4:30 in the morning. I wanted to get up early enough to watch the sunrise over the Golden Gate bridge. I hadn’t even thought about it until I was in California but then I realized I couldn’t miss the opportunity. After all, I knew this was an experience most people had on their bucket lists. When my alarm went off at 4:30 am, I definitely began to evaluate the importance of watching the sunrise in relation to sleep. That was short lived however and soon I was in my rental car, driving down into the Napa Valley. was captured the evening prior. It was a full moon that night and the entire valley was bathed in a soft radiance. The vineyards lay still with almost no movement save the occasional flutter of palm trees placed sporadically throughout. The valley which was so full of life the day before, with bicyclists traversing the streets and romantic couples holding hands along the sidewalks of Calistoga and Napa, now lay still and quiet. It felt almost reverent. The radio played quietly in the background while I continued driving into the silence, talking with God and enjoying the beauty. Suddenly a shooting star streaked past the moon. It was stunning! As the light faded into the black sky, I made a wish. A wish that I would never lose my love for the beauty in simplicity. A thick fog had crept into the lower portions of the next valley, completely enshrouding me. As the road began to climb again, the milky fog disappeared and the first rays of light began piercing the Eastern sky. The vibrant dark blue of the bay mixed with the pale iridescence silhouetting San Francisco was breathtaking. I rounded the next corner and there it was! The Golden Gate bridge loomed large ahead of me. I pulled off the highway and parked in one of the many turnouts hugging the hillside which flanks the bridge on the north shore. It was still fairly dark since the moon had hidden behind a cloud and the distant light rays were for aesthetic purposes only. I didn’t like the picture angle from the turnout so looked over the edge. Although it was steep, I saw a little path so figured I’d take it even though I couldn’t see but 5 feet down the “trail”. I could hear the waves crashing below and somewhere in the distance a fog horn kept blaring its warning to ships passing through the bay far below. My first two steps went alright but I soon realized the path was full of shale and slick rocks. 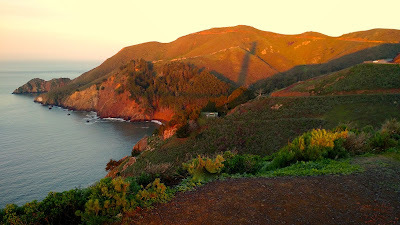 I began to slide and desperately hoped this path didn’t lead directly to the ocean below. Thankfully I bumped into one of the old gun mounts from when Fort Point was still active. I quickly set up my camera and waited. There was absolutely no wind. The peace was surreal. It provided a lot of time for contemplation and reflection; reflection on the busyness of life. The busyness which keeps us so preoccupied with life that we forget to live. Even good things can distract us, things that seem good from every angle yet silently keep us from what is best. Maybe that’s why God asks us to give them up sometimes… I took a few shots and then moved up to a different vantage point. Life is mainly determined by how you view it. A couple more photographers joined me up on the lookout. We shared experiences and discussed angles and apertures. And then we waited. The soft pinks and yellows began to deepen. The dark bridge slowly brightened as more light hit its iron beams. Suddenly, the gleaming sun appeared over the bay. Only a sliver at first, but its power scattered light everywhere. More people had joined us now. A guy near me was capturing a photo of his girlfriend in front of the bridge. A couple bikers had pulled up to watch as well. Another lady was sitting on a rock, gazing almost as if in a trance. 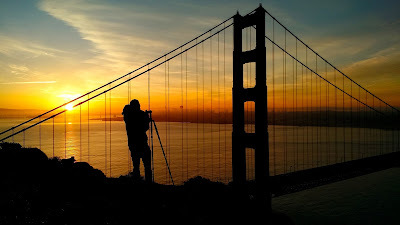 The sun continued to rise steadily until the golden orb was fully airborne and shedding it’s brilliant radiance over all of San Francisco and the Golden Gate bridge. The bridge was named after the Golden Gate strait, the part of water it was built to cross. That morning I discovered why. reflect the Son and you will be beautiful. The bay reaches the ocean through a narrow stretch of water which points straight towards the morning sun. As the sun gently rises over the bay, it bathes the entire strait in a golden hue making it literally the golden gate to the ocean. The bridge spans this beautiful phenomenon and stands as a watch guard over the bay. I glanced at my watch; only 40 minutes till my rental car was due to be returned. I sighed as I bid farewell to the timelessness of the experience and gave heed to the demands of a society run by hours and minutes. “Time is money” can be heard everywhere. The aim is to be more efficient, to get things done, to make it to the next appointment, get everything on our to-do list checked off. And the days pass. And life passes. And suddenly we realize we have used up all the time we were given and enjoyed hardly any of it. Do you have a bucket list? Don’t throw it away, simply re-label the items as goals with a practical plan to make those goals reality. And then start living. Here. Now. Go watch a sunrise from your rooftop. Talk with a complete stranger – for more than an hour. Make new friends and new memories. And travel! If not around the world, around your city. I heard it said once that travel is the only thing in life you can spend money on which will actually make you richer. I value life not by dollars or minutes but by memories and experiences. So today. Right now. Go fill your bucket list! gets overlooked in the popularity of the bridge. I appreciate these thoughts! It's so easy to pass up the beauty in the simple everyday things. Yes it is... But the simple beauty all around us is sometimes God's greatest gift.